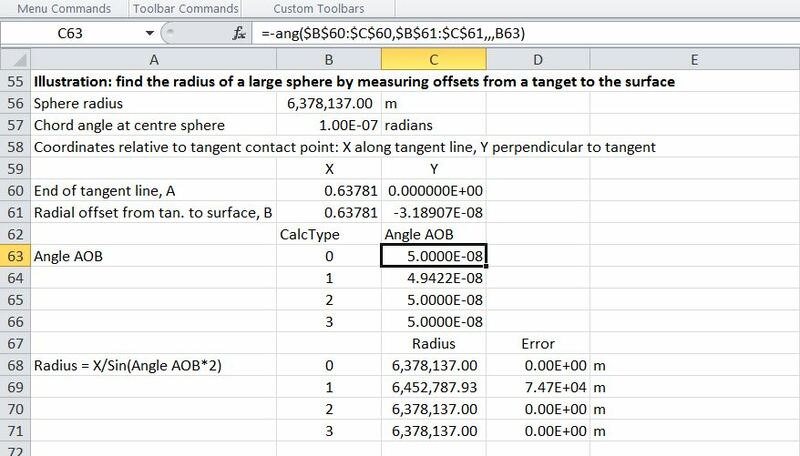 Further to comments by Georg under: The angle between two vectors, in 2D or 3D I have added four alternative ways of calculating the angle between two 3D vectors to the VectorFunc spreadsheet. The new version can be downloaded from: http://interactiveds.com.au/software/VectorFunc.xlsb. In this case Methods 0, 2 and 3 have all given an exact result, but Method 1 (using the Cosine of a very small angle) has an error of 7.47 km. To compare the results of Method 1 with the same procedure using higher precision arithmetic I have installed the latest XNumbers package (6.05.5M) which can be downloaded from http://www.thetropicalevents.com/Xnumbers60/. This package is based on the original XNumbers, but has been modified for Excel 2007 and later and improved performance. It can be seen that even using the Cosine the additional precision has given a near exact result. In the download version of the spreadsheet I have converted the XNumbers functions to text for the benefit of those who do not have XNumbers installed. To make the formulas active just press F2 to edit, and delete the ‘ at the start of the line. This entry was posted in Coordinate Geometry, Excel, Maths, Newton, UDFs, VBA and tagged 3D angle, Excel, UDF, VBA, vector, XNumbers. Bookmark the permalink.